In a major embarrassment to the BJP, Congress vice-president Rahul Gandhi will be “accepting” one of the largest national flags of India, prepared by Dalits at a technical institute off Sanand, Gujarat’s new industrial hub, which houses some of the most “prestigious” industrial units, including Tata Nano and Ford. 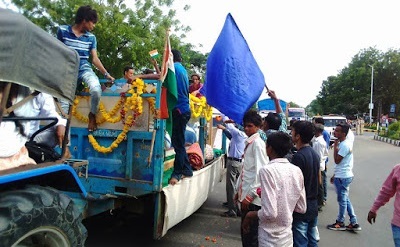 Taken by Dalits in a rally from to village Nani Devti, where the technical institute, Dalit Shakti Kendra (DSK), is situated, to Gandhinagar about four months back in a 50-km vehicles rally, Gujarat chief minister Vijay Rupani’s emissary refused to accept the flag saying the state government did not have “adequate space to keep it safe”. As already reported, on insistence, Rupani’s emissary gave it in writing that once facility for preserving the large sized national is created, “we would approach you and take the national flag”. 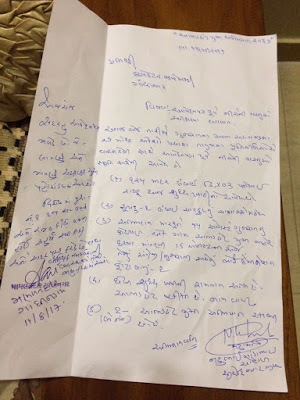 Rupani personally “did not have the time” to receive the national flag, hence he directed the district collector, Gandhinagar, to meet Dalit activists. The National Flag was brought in a tractor. The rally was organized as part of the Abhadchhed Mukt Bharat Andolan (Untouchability Free India Movement): Mission 2047, launched by Gujarat’s well-known Dalit rights leader Martin Macwan. Macwan also heads DSK, where mainly Dalit girls and boys are trained into different types of technical skills that would enable them to get a respectable job, even as empowering them to fight discrimination. A communique issued by Mission 2017 has called upon Dalits to reach DSK, situated on the Sanand-Bavla road, in large numbers on November 24. Gandhi, said the communique, would arrive at DSK at 12 noon. Earlier, the Congress leadership had offered Mission 2047 activists to hand over the flag at Rajiv Gandhi Bhawan, Gujarat’s Congress office in Ahmedabad. Refusing to accept the “offer”, Macwan told the Congress leaders that the national flag, which a symbol of Dalits’ national mission to fight untouchability, would be handed over to Gandhi “provided he reached out to us”. A 125 x 83.3 feet national flag, the communique said, would finally be accepted by Gandhi with “due respect” on November 24. The length of the national flag represents the 125th anniversary of top Dalit icon and father of the country’s constitution, Dr BR Ambedkar. 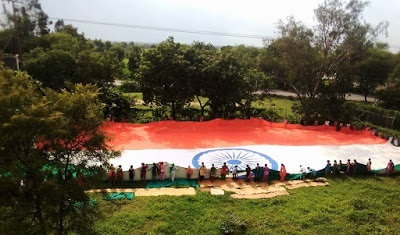 don't have space for national flag"
The National Flag, which was brought back to DSK, was prepared by Dalit students and teachers after spending 25 days. It is made of khadi, which is generally woven by the Vankar sub-caste of Dalits. Its designing, colouring and sewing was done by DsK students, mainly girls, with the help of teachers. Along with the national flag, the Gujarat chief minister was asked to accept a large-sized supda (winnowing basket), which carried a one-line memorandum, asking him to name one Gujarat village untouchability free on the Independence day, August 15. While the supda and the memorandum was accepted, the chief minister hasn’t yet named a village untouchability free.